Darjeeling district health administration today sought action plans from state departments that will help curb the spread of Japanese Encephalitis and Acute Encephalitis Syndrome this year. 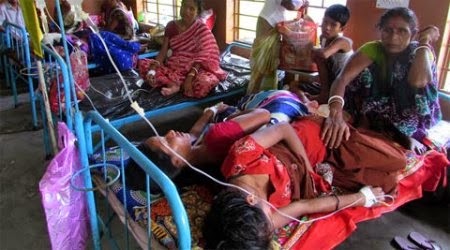 Asit Biswas, chief medical officer of health, Darjeeling, said the plan was sought at a district-level inter-sectoral co-ordination meeting on AES and Japanese Encephalitis. "We have asked the departments to prepare an action plan stating what their role will be and the steps they will take to check the spread of the diseases. The plans must be submitted to us by February 28 and we will hold another meeting by the second week of March to come up with a comprehensive plan outlining preventive measures and treatments so that the disease does not spread on a massive scale," he said. Last year, more than 200 people died of AES and JE in north Bengal. In Darjeeling district, 132 AES cases, including 29 deaths, and 30 JE cases, including 10 deaths, were reported. "We have vaccinated 16,000 babies in the district. We have asked the animal husbandry department to give us details of places where concentration of pigs, that carry the germs, is high," Biswas said.